LOOKING FOR A KITESURF SCHOOL IN LISBON AREA ? HERE IS EVERYTHING YOU NEED TO KNOW ! Lisbon is well-known as one of the cultural capitals of Europe. Voted Europe’s Leading City Break Destination three times over the last eight years, it is self-evident the historic legacy & buzzing atmosphere of Lisbon have made it one of Europe’s most vibrant capital cities, just a short drive from some of the best kitesurfing and surfing beaches on the Portuguese coastline. A well-renowned mecca for surfing, this charming city is dripping with endless summer vibes and is a must-see destination for anyone looking to sample delicious local dishes, savor home-grown wines, and enjoy a mix of urban and beach adventure. Cheap to visit and easy to reach, Lisbon continues to capture the hearts of independent travelers hungry for adventure, couples looking for a romantic retreat, and families in search of an unforgettable getaway. The variety of kitesurfing spots within a short drive of the Portuguese capital deliver the promise of conditions that cater for every rider, no matter what level. Of course, some spots are more easy to learn how to kitesurf than others and this must be taken into consideration when choosing a kitesurf school in Lisbon. 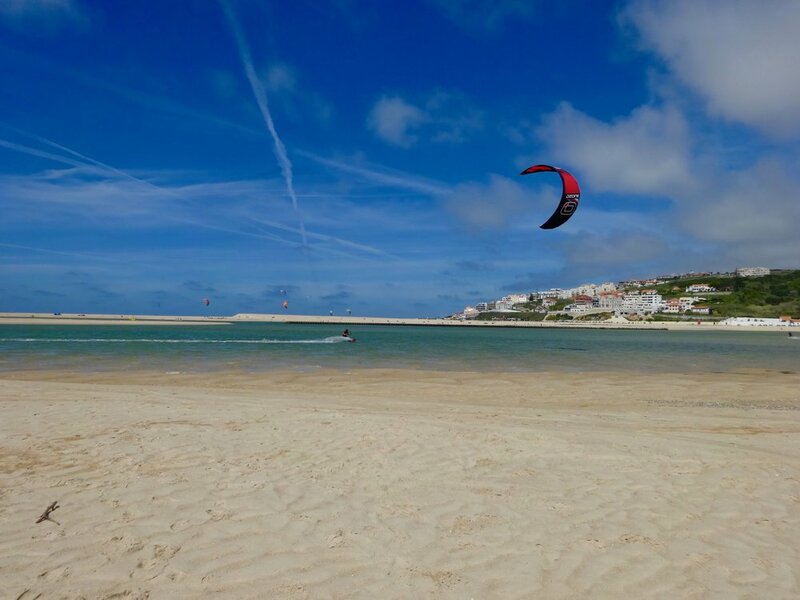 Additionally, unlike some of the more infamous surf spots in Peniche and Baleal (a short drive north of city), the kitesurfing scene in Lisbon is a relatively well-kept secret and it is easy to find world-class conditions without the crowds that often come with them. This is a priceless commodity when looking to learn how to kitesurf, particularly if you are looking for the best kitesurfing spots for beginners in Europe. The most important factors you need to take into consideration when searching for a kitesurfing school in Lisbon include the space available in which to learn, the competing crowds, favorable wind conditions and flat, shallow water. The following information is designed to give you a quick briefing on the best spots you can choose from to learn to kitesurf in Lisbon and its surrounding areas. Here we mention the most prominent spots to kitesurf in Lisbon. As Portugal’s largest lagoon, Obidos is ideal for kitesurfing year-round. Almost all wind directions work here, even easterly winds are reinforced by nearby mountains. Home to flat water and consistent winds, the Obidos lagoon is definitely the best place to learn how to kitesurf around Lisbon. This is undoubtedly one of Europe’s hottest summer wave spots. Strong gusty winds swing between west-north-west and north-westerly (cross-on to cross-shore) and gradually increase throughout the day. The medium to big swell and the shore-break at high tide mean this spot is the preserve of experienced riders. This is definitely the place to go for those who know how to carve up good swell! This spot is surrounded by charming forest and beach bars. The swell is smaller than in Guincho which makes it really popular for both aspiring and experienced waveriders. The predominant wind is cross-shore north-west and will most of the time blow late afternoon for 2 to 3 hours. This lagoon, with standing-depth water in many parts, offers plenty of space out of season, therefore an amazing playground for beginners and freestylers due to its flat water. However, there is rarely much water in summer and it gets very tight with so many swimmers. A scenic fifty-minute drive from Lisbon will bring you to the well-preserved medieval world of Obidos. This quaint little town is home to an enchanting 12th century castle, the walls of which encircle the local artisan’s unhurried way of life. 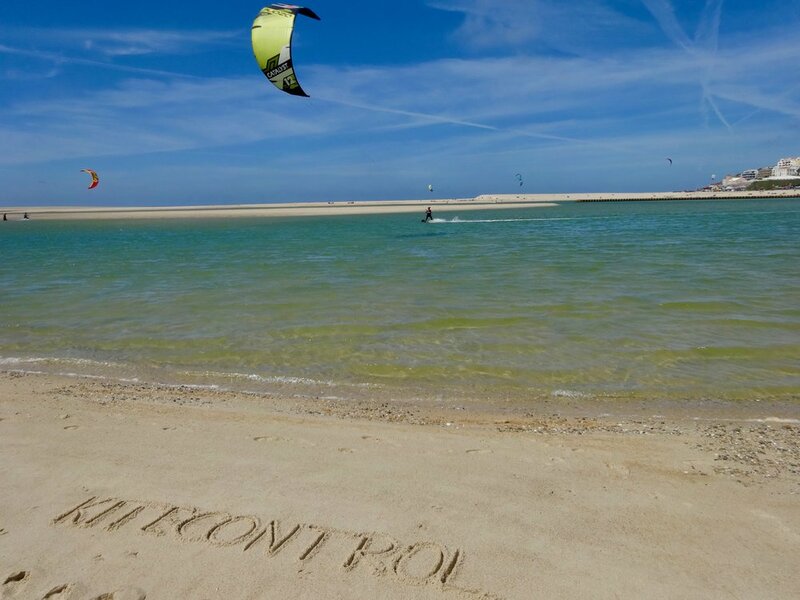 Perhaps more well known to kitesurfing enthusiasts, however, is nearby Obidos Lagoon. 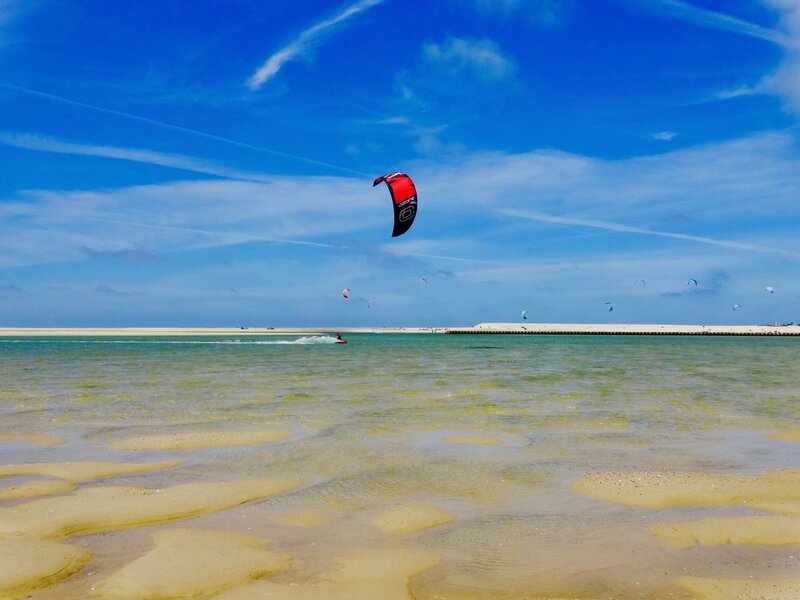 If you are a complete beginner or intermediate rider then the Obidos Lagoon is undoubtedly one of the best places you can learn to kite in Lisbon. The “Lagoa de Obidos” is Portugal’s largest salt-water lagoon and is perfectly situated on the coast. Here we feel the full force of the Nortada winds blowing in from the Atlantic Ocean whilst simultaneously being sheltered from the incoming swell. The flat calm waters of the Obidos Lagoon not only offer a safe haven in which we can teach our students, but a relaxed environment in which you can learn how to ride and more generally improve your level. Due to the waist-deep waters we don’t have any need to keep you on the beach, and we start the very first lesson of your kitesurfing course in the water. Not only is there plenty of space, an essential factor when learning for the first time, but the flat waters also provide the perfect opportunity to master more difficult aspects of kitesurfing such as relaunching your kite, upwind riding & jumping. We are also situated only a 5 minute drive away from Praia Rei Cortico, an epic surf spot known only to the locals. Wake up the right way and go for a surf in the mornings before learning how to master the kite in the afternoon. If you need a hand renting a surf board for a few days just let us know and we can sort that out for you. After your surf session you can head down to N’Aldeia restaurant, a lovely restaurant by the beach which serves locally-sourced seafood and home-grown Portuguese wines. We are good friends of the owners and friendly staff who are always happy to welcome our students with open arms and a cold beer or chilled glass of wine. The team at Kite Control are proud to offer our assistance and lesson courses in 5 languages including English, French, Portuguese, Spanish, & Ukrainian. We also provide boat assistance to those who need it and each student is reminded that as part of our package they are covered under our insurance.